Are Luxury SUV's the Next Land Yachts? Big, bold, brash, and they consume gas at a horrendous rate. The luxury SUV is the vehicular equivalent of an elephant. At least an elephant is agile enough to parallel park which is more than can be said for a luxury SUV. The luxury SUV hit the market in the late 1990’s. The Lincoln Navigator was first to the new niche in 1997. And for the next decade the ostentatious beasts covered in gilded chrome and powered by V8 engines would be at the heart of American consumers. 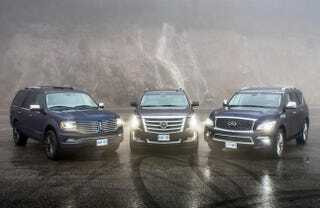 Once the Great Recession hit and gas prices sky rocketed the luxury SUV market began to decline. The death of the luxury SUV appears to be coming. With sales often barely breaking 20,000 a year for the Escalade and even less it’s competitors. The luxury SUV is becoming something of a dinosaur just like the land yachts of the 20th century. The massive V8s in them are scaring away buyers and more practical options such as the CUV markets are emerging to steal buyers. Will the luxury SUV ever enjoy a collectability like that of the land yachts of the 20th century? They occupy center stage when one thinks of luxury cars during the first decade of the 21st century. Their desirability and oddity well surly transcend into collectability right?